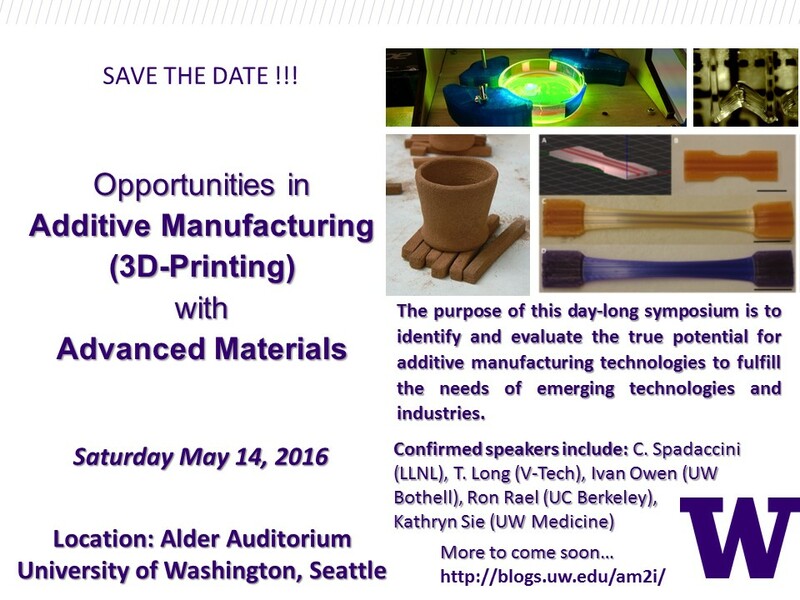 For information about last year’s inaugural additive manufacturing symposium, you may find a summary at Open3DP. This 2-day symposium will bring together an international audience from industry and academia to discuss the cutting edge of additive manufacturing technologies. A particular emphasis is placed on the interface with functional polymeric materials.The event is open to the public and we warmly welcome students and industry professionals from diverse fields. The symposium is a two-day event from 9:00 am – 5:00 pm each day, including boxed lunches in Kane Hall. There will be a post-symposium reception on Thursday. On Friday, a post-symposium reception will be held on an Argosy Cruise, located at Pier 55. This three-hour event will also include an opportunity to see 3D printing in action. A full print-friendly version of the schedule is available to download soon. 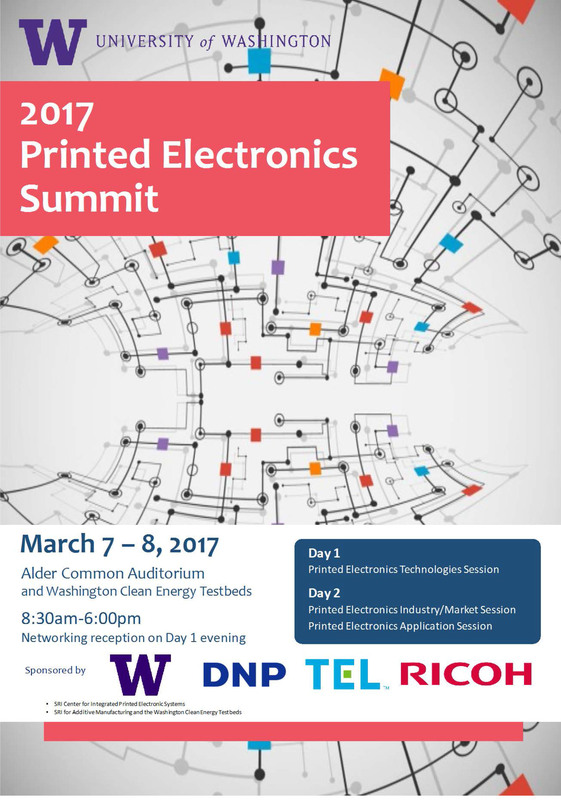 Attendees will have the opportunity participate in an afternoon poster session to present their own work in 3-D printing. Demo tables and opportunities for sponsorship are also available. Please contact Prof. AJ Boydston directly with any questions (ajb1515@uw.edu). The Royal Society of Chemistry will be sponsoring a poster prize. The winner will be announced at a special ceremony during the symposium. Thanks to support from our educational partners, all registration fees are considered tax-deductible gifts to the University of Washington. All guests will receive a gift receipt from the UW Foundation in addition to ticket confirmation. Registration is nonrefundable. This entry was posted in Uncategorized on April 26, 2017 by ganter. 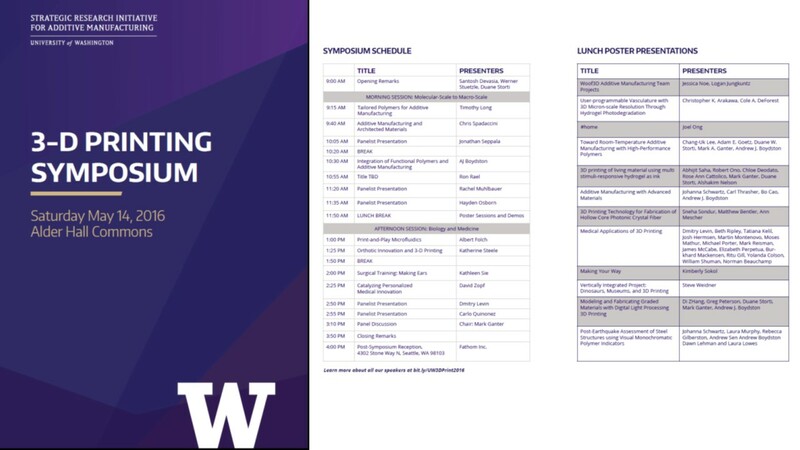 Thank you for attending the inaugural 3-D Printing Symposium at the University of Washington: Opportunities in Additive Manufacturing with Advanced Materials! 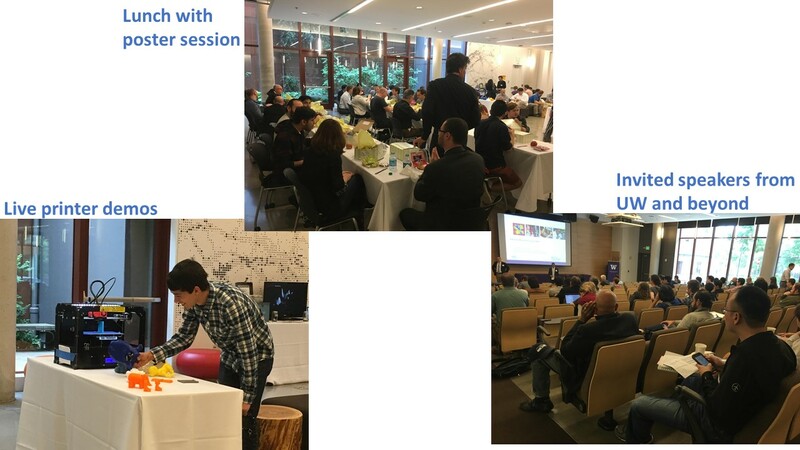 We had a fantastic event with more than 100 speakers, panelists, and poster presenters covering diverse topics that included polymers and new functional materials, advanced printing techniques, art and architectural design, and medicine.This was a stimulating day with many active discussions, and we look forward to working with you to advance the field of additive manufacturing. A very warm thanks to our sponsors FATHOM and Stratasys. We extend our particular gratitude to our friends at FATHOM for their hospitality in hosting both a wonderful reception and tour of their pioneering work space and printers. FATHOM is ecstatic about the level of interest in 3D-printable microfluidic hardware, and looks forward to collaborating with many of you in the near future. FATHOM’s Director of Research, Carlo Quiñonez, PhD, can be reached atcarlo@studiofathom.com. 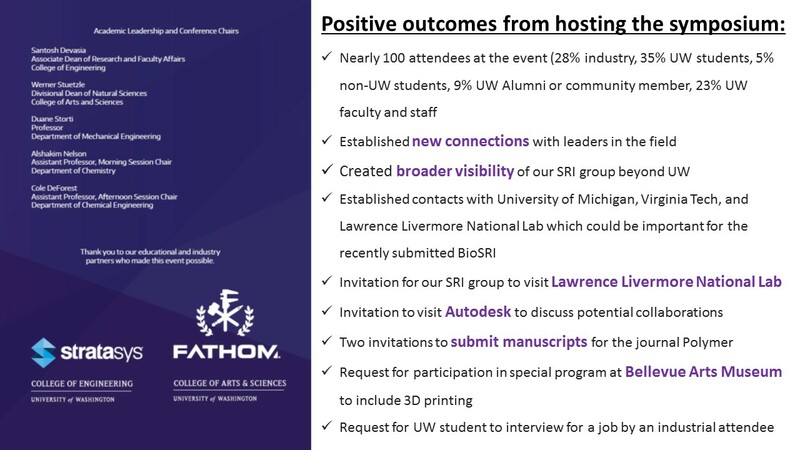 The FATHOM team, located at its Seattle-based office and production center, is happy to work with UW students and faculty on any upcoming 3D printing projects! Reach out with any questions to Dylan Oliver, FATHOM’s general manager dylan@studiofathom.com. During the course of the Symposium, several of you noted an interest in partnering with the UW on research and collaborative projects. We are excited to hear from you. 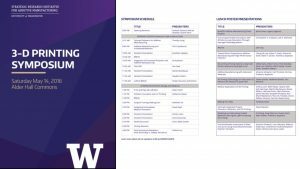 Please contact Duane Storti at storti@uw.edu or Alshakim Nelson at alshakim@uw.edu if you would like to explore innovative and collaborative opportunities with the UW. Please visit our blog for updates about our research and leading-edge academic experiences for students. 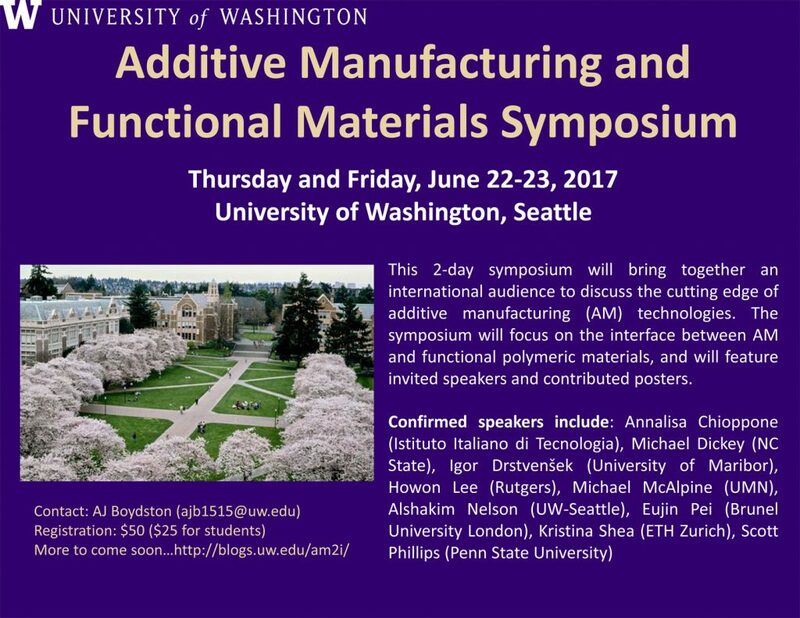 We hope to offer another additive manufacturing symposium on the UW campus next year, and we are also in the midst of planning the Zing Conference on additive manufacturing in Portugal in June 2017. This entry was posted in Uncategorized on June 1, 2016 by alshakim. 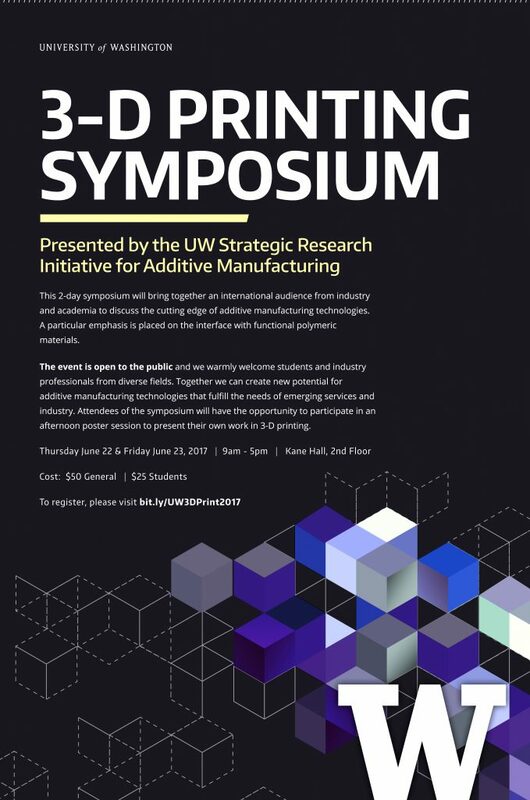 Hosted by the UW Strategic Research Initiative for Additive Manufacturing, this day-long event offers an unprecedented chance to witness the latest advances in 3-D printing and scholastic research for one of the most critical societal opportunities in modern history. Our faculty, students and corporate partners are working together to identify and evaluate the true potential for additive manufacturing technologies to fulfill the needs of emerging technology and industry. 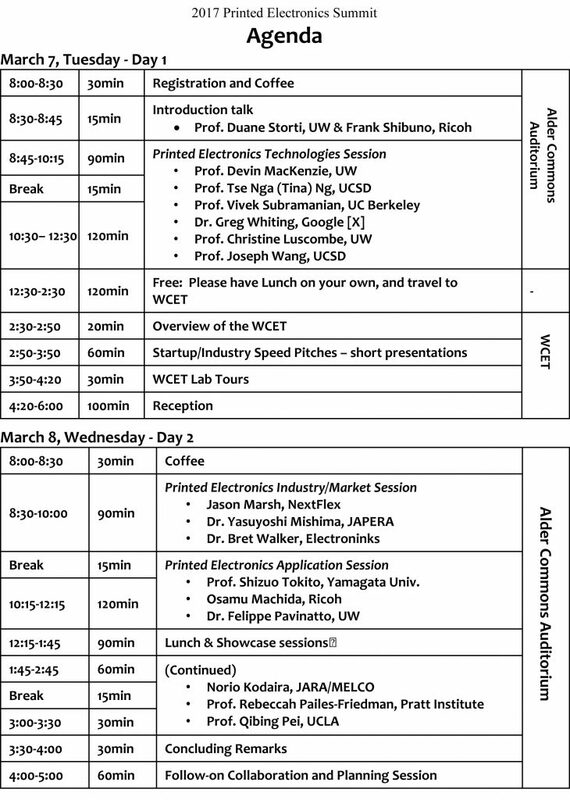 Topics of discussion will include 3-D printing related to new polymeric material compositions, micro-architectured materials, art/architecture, medicine, prosthetic development, and microfluidics. * The post-symposium reception will be co-hosted by Fathom Inc. which has a facility just blocks away from the UW campus. This is an opportunity to see live demonstrations of the most advanced 3D printers that are available on the market, while enjoying light appetizers and beverages with symposium participants. A shuttle service will be provided to transport (8 minutes one way) attendees to and from the Fathom facility. Use the tabs above to find out more about the symposium! This entry was posted in Uncategorized on April 19, 2016 by alshakim. This entry was posted in Uncategorized on January 21, 2016 by ganter. During our next regular SRI team meeting (Tuesday Nov. 3 at 11:00 in More 218) we will be joined by Prof. Kira Barton from the University of MIchigan. develop a robust closed-loop system for measurement and compensatory control. Department of Mechanical Science and Engineering Outstanding Young Alumni Award. This entry was posted in Uncategorized on October 26, 2015 by storti. Congratulations. I am very pleased to inform you that your Strategic Research Initiative proposal entitled “Rapid Deployment of Designer Materials in Devices and Smart & Resilient Infrastructure (SRI) Enabled by Additive Manufacturing” was selected for funding by internal reviewers and the final SRI Selection Committee. This entry was posted in Uncategorized on October 22, 2015 by am2i.